Strap yourself in for The Final Frontier, the new Iron Maiden Flash game that gives players a chance to save the latest and greatest Iron Maiden tour from pirates - in space! The amusing thing about Iron Maiden is that for years, it was perceived by a large chunk of society as a gang of baby-eating devil worshippers who sought to glorify Satan with every new album. But the truth is that they're not so much arch-demonists as they are a bunch of guys who never quite managed to fully emerge from the cocoon of adolescence - or who made a conscious decision to embrace it. Case in point: The video for the first song off the band's new album, a goofy, action-packed adventure in space, loaded with CGI, blazing lasers, explosions and of course Eddie, the grinning Iron Maiden mascot. So why not a videogame to go along with it? The Final Frontier isn't exactly Freespace 2 but it is actually a fairly impressive endeavor for a Flash game, with five levels, multiple kinds of power-ups, bonus content for anyone patient enough to unlock it and of course a suitably cheesy story to give the whole thing purpose: While on its latest intergalactic tour, the Iron Maiden spaceship was attacked by space pirates! 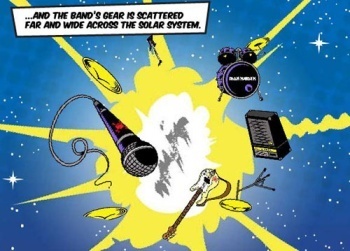 The band managed to escape but its equipment was scattered all over the solar system and now it's up to you, the Iron Maiden space-roadie, to track it all down and save the day! It's not likely to win any awards for writing, but it is fun to play in an old-school space shooter kind of way. And there's more to come: FEARnet says that the game's "sequel," Mission II: Rescue and Revenge, will be included with the deluxe "Mission Edition" of The Final Frontier, which is due to come out August 17.